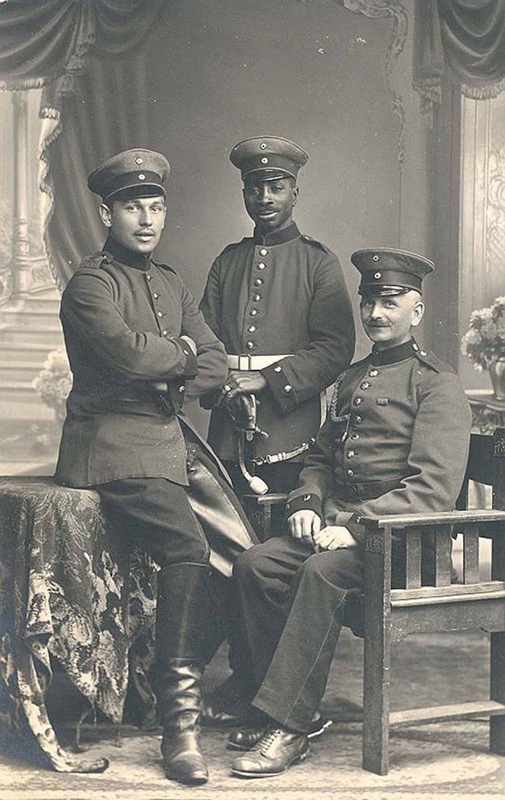 Josef Mambo (born in 1885 in Tanga, East Africa) was brought to Germany as a child (1897) and later served as the kettle drummer in the 3rd Prussian Horse Grenadiers (“Grenadier Regiment zu Pferde ‘Freiherr von Derfflinger’ Nr. 3”). During the First World War he was promoted through the ranks to Sergeant and was twice wounded, once in Russia and once at Verdun. The Germans, as the only colonial power amongst the Central Powers, used plenty of African soldiers of theirSchutztruppen in the African theaters of war, but they had never planned to deploy these troops in Europe and would not have been able to do so during World War I for logistical reasons anyway. However there were a few black soldiers enlisted on the German Imperial Army (Continental Army). Most were involved in non-combat duties, like musician. There is almost nothing written about them and the likely total is less than 15. Comparatively, millions of Germans served in combat and non-combat roles. Much of this was due to conscription which was not applied to the Kaiser’s African subjects. Since the 17th Century it was popular for European armies to have African bandsmen in their elite regiments. As early as 1685 an African known as Ludwig Besemann was promoted to First Class Drummer (“Heeres-Pauker Erster Klasse”) in the army of the Great Elector Friedrich Wilhelm of Brandenburg-Prussia. Other Prussian rules continued the tradition through the 18th Century. King Friedrich I had 15 African pipers in his Life Guards (“Leibregiment”). Friedrich Wilhelm I had sixteen African musicians in his artillery. These were doubled under Frederick the Great (King Friedrich II) so that by 1759 there were 32 African musicians in the Prussian artillery. 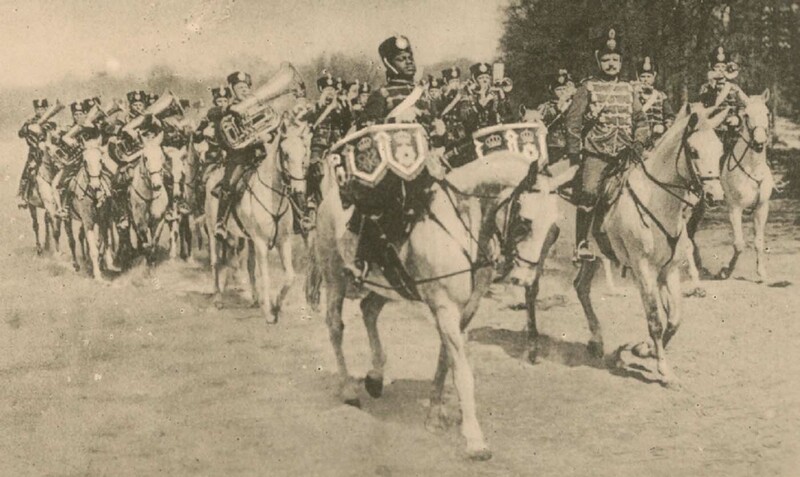 Several other German states also had African musicians in their armies. The Hessian mercenary armies fighting on the British side in the American War of Independence recruited freed Afro-American slaves as their bandsmen and sometimes as soldiers. Richard Knötel illustrates an African drummer in the Oldenburg Grenadiers of the Napoleonic Wars. During the Imperial era there were a small handful of Africans who served as musicians in the Imperial army. There were also other Africans living in Germany who had been brought there by various royalty or upper classes as servants or entertainers. One hundred Africans were brought from the African colonies to Germany for the 1896 Colonial Exhibition in Berlin. 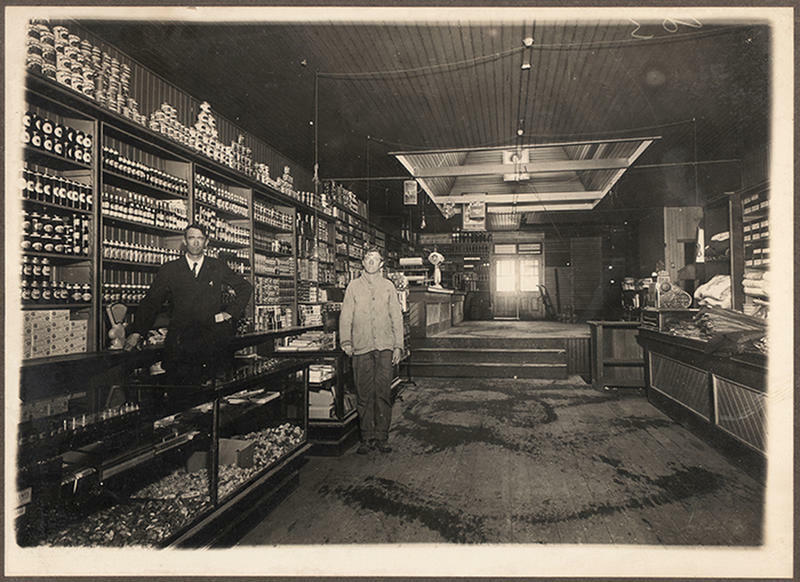 Some of these men stayed on in Germany, took German wives and became naturalized German subjects. They usually felt loyalty towards their adopted country and several are known to have served in the Imperial Army on the Western, Eastern and Palestinian Fronts during the First World War. Music Master Gustav Sabac el Cher, 1st Prussian Grenadiers. This photograph of Musikmeister Gustav Sabac el Cher shows him in the uniform of the 1st Prussian Grenadiers (“Grenadier-Regiment Kronprinz (1.Ostpreußisches) Nr.1“) and was taken in 1908. His uniform consists of a dark blue Prussian Infantry tunic with the regimental elite collar Litzen and the fringed swallows nests and shoulder straps of a Music Master. Being the oldest regiment of the Prussian army, the Pickelhaube spiked helmet of this regiment has the notable scroll of their formation date “1655” across the eagle. The medals worn on the left breast are the Prussian General Honour Decoration, Prussian Wilhelm I Centenary Medal, Bavarian Military Merit Cross (an early issue without flames) and an unidentified Russian medal. Below his bar is a pre-1913 Prussian Long Service Award. 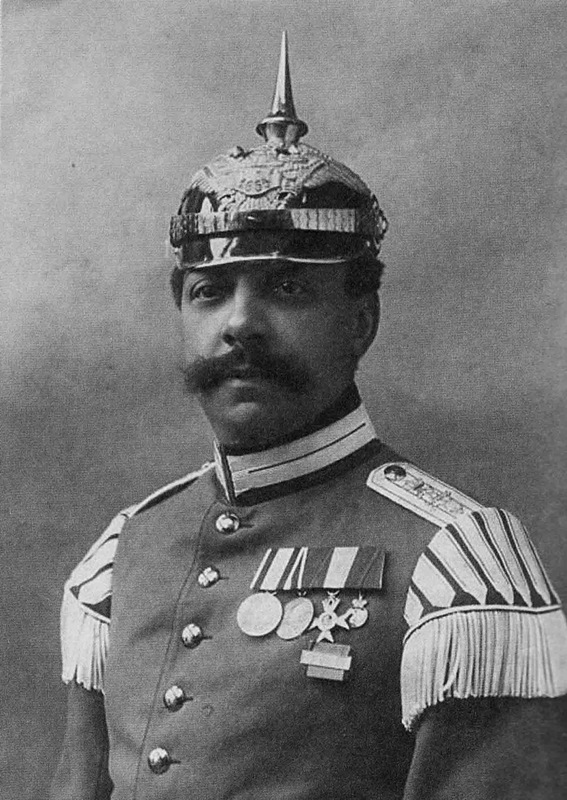 Gustav Sabac el Cher (1868-1934) was the son of a Sudanese valet to Prince Albrecht of Prussia and his German wife. Gustav attended the Imperial Music High School in Charlottenburg and later served as Music Master to the elite 1st Grenadiers (“Grenadier-Regiment Kronprinz (1.Ostpreußisches) Nr.1”). He retired from the Army in 1909 and worked as a civilian music conductor appearing on radio several times in the 1920s. He and his wife opened a cafe in Berlin but were forced to close it under pressure from the Nazi authorities. He died shortly afterwards. On hearing the news, the Kaiser sent Gustav’s widow a personal telegram of condolences. Schellenbaum player Ben Aissa, 1st Prussian Foot Guards. This photograph of Unteroffizier Ben Aissa of the 1st Prussian Foot Guards (“1. Garde-Regiment zu Fuß“) was taken in Potsdam in 1907. He wears full dress uniform consisting of a dark blue Prussian Infantry tunic with white metal buttons, red piping and red collar and Swedish cuffs both bearing white Litzen. The shoulder straps are plain white. As a player of the “Schellenbaum” or Turkish Crescent, he wears musicians swallows nests in red and white on each shoulder. The headdress is a Grenadier style mitre worn only on parade. Ben Aissa was born in Morocco in about 1887. He was employed as a servant to guide Kaiser Wilhelm II’s horse through Tangiers on a visit in 1905. During this tour he was befriended by the Kaiser and was invited to visit Berlin the following year and in 1907 to move to Germany. He joined the band of the elite 1st Prussian Foot Guards (“1. Garde-Regiment zu Fuß”). He continued to served with them during the First World War. In 1917-18 he served with the Asienkorps in Palestine. After demobilization in 1919 he returned home to Morocco. Kettledrummer Elo Sambo, Prussian Life Guard Hussars. This photograph of Elo Sambo shows him wearing the Dolman tunic of the Prussian Life Guard Hussars (“Leib-Garde Husaren Regiment“). It would have been dark blue with yellow metallic braiding and back fur edging. Note the musicians swallows nests on the shoulder. His peakless cap would have matched his uniform being red with a dark blue hatband and a small Prussian cockade. Elo Wilhelm Sambo (1885-1933) was born in Jaounde, Cameroon. It’s unknown how he got to Germany but he was endorsed as a godson of Kaiser Wilhelm II. 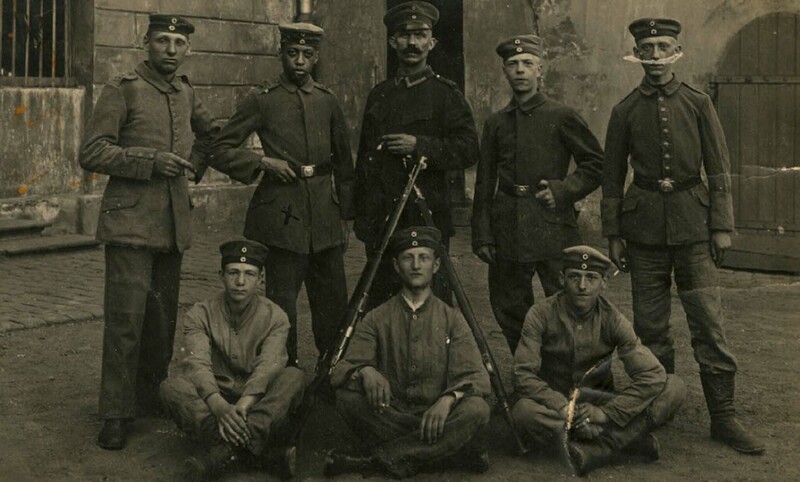 He joined the Prussian army in 1905 (“Eisenbahnregiment Nr. 1”) but in 1907 was transferred to the Life Guard Hussars (“Leib-Garde Husaren Regiment”) and trained as their kettle drummer. He served with this regiment during the First World War and after the war with the Reichswehr’s 4th Mounted Regiment (“Reiterregiment Nr. 4”) until 1923. He later lived in Cologne where he joined carnival societies such as “Rote Funken” and later “Blaue Funken” as a kettle drummer for the Carnival Monday Processions. He died 1933 and was buried on the Southern Cemetery (“Südfriedhof”) in Cologne. Kaiser Wilhelm sent a wreath for the funeral.